Continuing our series of the wives and mothers who helped shape the story of Box, this is an article about Leah Reason who was born in Ramsbury in 1850, near Marlborough, and came to Box when she married William Cogswell. Hers was a life that many women experienced. She was born the eighth child of a carpenter and worked in service in Bath until she was 23 years old. She married William Cogswell, a quarryman, and she and William lived with his parents at Brookwell on Box Hill. Leah's married life was one of hard domestic work, bringing up children and maintaining the home. These jobs were a vital part of domestic life but the role of women's work has often gone unrecognised by society. Hopefully this article helps to redress the ommission. Leah died in 1894. She had helped to found a dynasty which is still in the village today in her role as mother, children's instructor, domestic organiser and general skivvy. It was a situation known to many women. Right: Leah probably at the time of her wedding day in 1873. 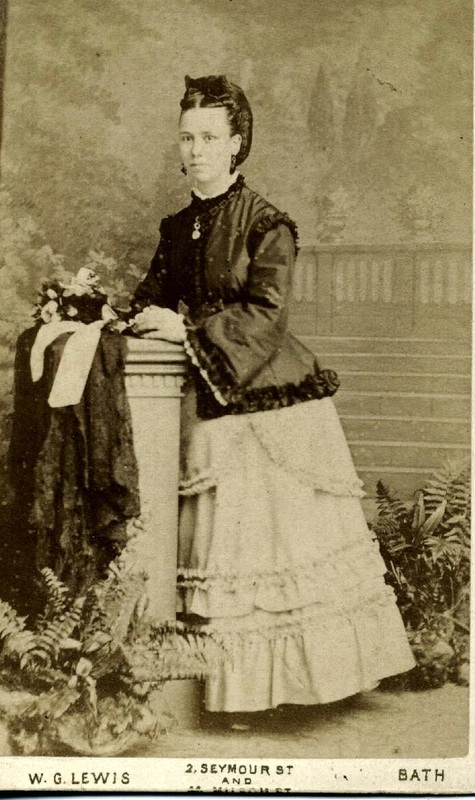 Leah was born in Ramsbury, Wiltshire on 16 May 1850 and her parents were George Reason (b 1793 in Ramsbury d 1859), who was a carpenter, and Elizabeth North (b 1814 d 1890). The Reason and North families had lived in Ramsbury since at least 1792 as they are shown as renting property on the tithe map of that year. There were no Reasons in Ramsbury before 1782 (I have checked all parish registers) and there is no indication where they originated. Leah’s paternal grandparents were Robert Reason and Elizabeth Piper, born in Marlborough in 1753. She died in Ramsbury in 1816. Elizabeth’s parents were John Piper (b 1724) and Mrs Betty Piper (b about 1728), both from Marlborough. George Reason was married twice. His first wife was Caroline Barnes, whom he married in 1816. She gave him three children, George, John and Sarah Ann. Caroline died in 1833 and George then married Elizabeth North. Elizabeth had also been married before, to John Noon, by whom she had two sons, Frederick and John. John Noon died almost immediately after little John was born and Elizabeth (probably needing support) married George Reason very soon after. She was 27 and George 47. Leah was the eighth of George’s nine children but his sixth with Elizabeth. Presumably she lived and went to school in Ramsbury. They all lived in Blind Lane (now called Union Street). In Barbara Croucher's book The Village in the Valley is a wonderful map dated 1839 which astonishingly tells us that, in that year, Elizabeth Reason (who we think was Leah’s aunt born in 1783) was living in a cottage in Andrews Lane (now Crowood Lane), a continuation of Blind Lane after crossing Whittonditch Road. This Elizabeth was a shopkeeper and lived on the east side of Andrews Lane in a group of three cottages with gardens owned by Joseph Twine. The other two cottages were rented by James Minal and William Mace. Elizabeth rented the middle one. We presume she ran the shop from her cottage. We have some photos of cottages at the top of Andrews Lane but cannot be sure which might be hers. At the Chippenham Record Office we were able to look at the tithe maps and discover who owned all these cottages and who was renting them. Other members of the family lived in the village. John North, Leah’s maternal grandfather, lived in a cottage on Oxford Street, adjacent to Thomas Minall. Another relative living nearby was Elizabeth Noon. She was part of the family of Leah’s mother’s first husband, John Noon, who died in 1838. According to the Tithe Map of 1792, Elizabeth lived lower down Blind Lane in one of four terraced cottages owned by James Lawes. Also further down Blind Lane in another group of cottages, this time owned by Josh Orchard, lived Thomas North, John Orchard (woodman) and James Taylor. According to the1839 map other people living and working on Andrews Lane were James Andrews (blacksmith) almost next door to Elizabeth Reason, and Richard Hazell at the Beer House (Crown and Anchor pub). Across into Blind Lane we find John Alexander, wheelwright and shopkeeper (grocer), at the cross roads, and John Lansdown, carpenter and wheelwright workshop. These cottages and buildings are still there. Opposite John Lansdowne was George Smith, blacksmith, then John Grenaway. Further down the east side lived William Marsh, apothecary, and on the other side were the Ramsbury Overseers of the Poor and then John Orchard, woodman. There are a number of carpenters and wheelwrights so there must have been plenty of work for men like George Reason. From the 1861 census we can see that Elizabeth Reason was now a widow, George having died two years earlier. She was now living in High Street with her children: Charles, a butcher; Sarah Ann; Leah (who was ten); and Lydia. Elizabeth’s father John North had moved in with them, now aged 73. Next door but one is George Reason junior (son of George and his first wife Caroline). The next time we find Leah is on the 1871 census where she appears as a servant to Mr William Brownlow and his wife Frances. William Brownlow, who was born in London, gave his occupation as rector of Wilmslow, Cheshire but as he was now 69 years old we must assume he had retired. They were living at Tain House, Park Lane, near Victoria Park, Bath and they had two other servants besides Leah. We know a little about Leah's employer, William Brownlow, and his family. He was born on 11 April 1901 in St Bride’s, Fleet, London and his parents were William and Patience, living at Number 68 Fleet Street. He was a minister in Cheshire from 1841, first as a clerk, living at the Rectory in Bollin Fee with Frances and their daughter Melise. By 1851 he had moved to the Parsonage there, and by 1861 they had moved to Bath, at 28 Gay Street and thereafter in Tain House. How Leah Reason met William Cogswell isn’t known. Probably they were neighbours because at the same time as she was living at Tain House, Bath, he was shown on the census as a mason, living at 30 Walcot Street quite nearby. Perhaps they met in the park? They were married on 28 October 1873 at the Church of St Michael (Without). William was 25 years old and Leah was 23. The witnesses were William’s brother Harry and Leah’s sister Lydia Reason. Recently we have visited this beautiful church which whilst now in the centre of Bath, was originally outside the walls of the city, hence St Michael (Without). William was born in Wellington, Somerset, on 4th January 1848 the second of five children of Mark Cogswell and Elizabeth Jerome Draper. When he was 3 years old, they lived at 8 Crooks Gardens in Bristol and his father Mark was working as a switchman on the Great Western Railway. As for the 1861 census William aged 13 is nowhere to be found, perhaps he was visiting relatives. Ten years later though we find William with his parents, Mark and Elizabeth at Drewetts Mill Lane (Brookwell) in Box. William’s brother Harry and their two sisters are also there. Both brothers are stone masons and their father is a railway pointsman. Left: William Cogswell at the time of his wedding to Leah. The next piece of information about Leah is that she and William were still living in Box, where she gave birth to their first child, Alice Maud Kate on 18 May 1874. So, like so many women of the time, she was already pregnant when she married. They went on to have three more children, all sons: Albert (Bert) Frederick William, 1877, Harry James, 1879 and Percy Mark (PM), 1882. Brookwell Cottage (now demolished) used to stand up from the Rising Sun inn, just down the lane to Millsplatt. According to the 1881 census just prior to PM’s birth, they all lived at Box Hill and William was still a stone mason. By the next census, when Mark was 71 and retired and Elizabeth was 69, they were living at Brookwell with William, Leah and the four children. William was a banker mason (a skilled craftsman) and their eldest child Maud, aged 16 was a dressmaker. All the children attended Box School. Tragedy struck on 4 January 1894 when, after a year’s illness, Leah died of heart disease. Her tomb in Box Cemetery is carved with the sentiment: Beloved Wife of William Cogswell. Maud, her eldest child was not quite 20 and the boys were all still very young: little PM was only 12. Her husband William was heartbroken and struggled on for a couple of years and then married Annie Slade in1898. She took on William’s growing family and held it together and became a much loved stepmother and gran. William died at Mill Lane of rheumatic gout, enlarged prostate and exhaustion on 30 June 1918 and was buried alongside Leah. Annie, born in1854 lived until 18 March 1947, aged 93 when she died. Right: Annie Slade, William's second wife. 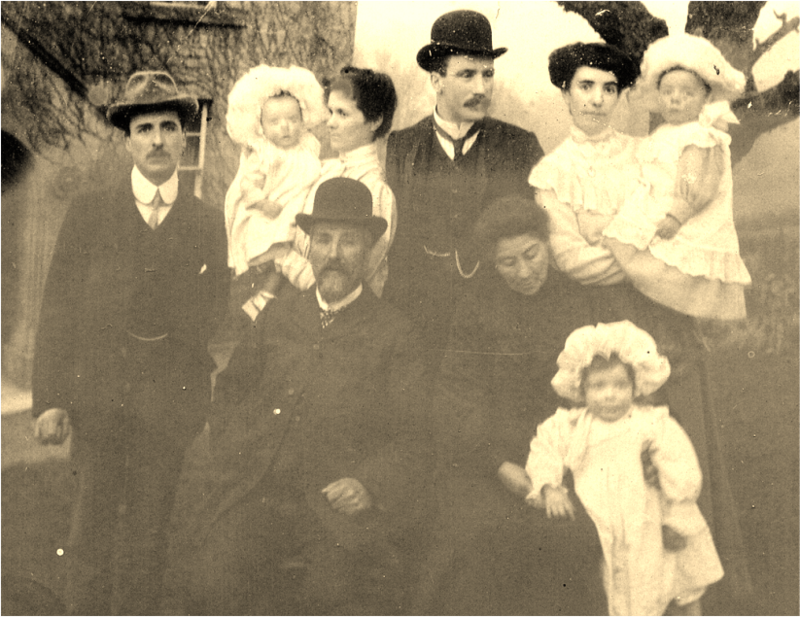 This group is believed to include William Cogswell and his second wife, Annie Slade Cogswell, in the centre with Winifred Leah (daughter of Albert and Florence), born 1904. Behind are possibly two of his sons with their wives and children. We think the couple on the right are Harry and Ellen Cogswell with William George Cogswell born in 1905 (also went to USA). On the left we think they are Albert Cogswell with his wife Florence Alice Conham with their son Edward James Cogswell born in 1906. We assume the photo to have been taken around 1907 at Brookwell Cottage, Box. In the course of researching this article Sheila asked historical costume expert Jayne Shrimpton for her opinion of the photos above taken by WG Lewis of 22 Milsom Street, Bath, which she thought were of William and Leah Cogswell about the time of their marriage in October 1873, at St Michael’s Without, Bath. Jayne's report below gives her opinion on the photos. This studio photograph is a carte de visit (cdv), measuring approximately 10 x 6.5cms. Although the larger cabinet print format was introduced in 1866, it was scarcely used until the 1880s, so early printed photographs are usually small cdvs. The photographer’s details are clear enough on this mount, but unfortunately there isn’t a convenient online database covering early photographers in the Bath area. However photographer operational dates aren’t needed in this case, as the visual image provides us with a close date range. Looking at the picture, we see again the full-length composition typical of the 1860s and early 1870s, although this artificial setting is more complex than that of the previous photograph. New elements here are the elaborate painted ‘outdoor’ backdrop depicting steps and classical balustrade against a wooded landscape, and ferns in the foreground – features often introduced into full-length compositions of the 1870s. Usually the subject’s clothing offers a good idea of date, especially in the case of women, as female fashions changed regularly in the Victorian era and can usually be pinpointed to within about 5 or 6 years. 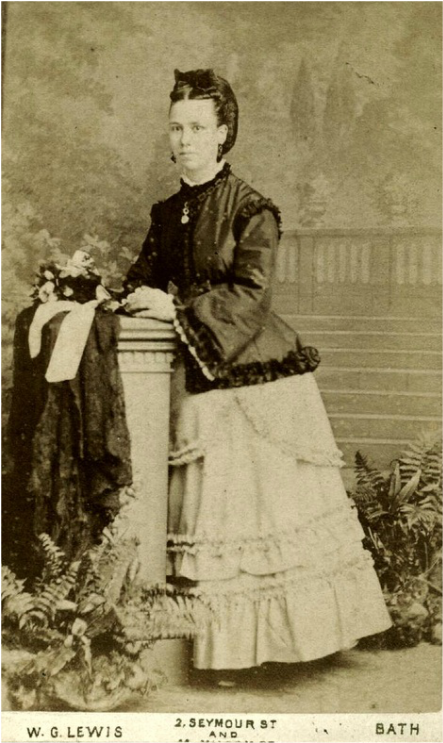 Here Leah wears an attractive outfit that dates this photograph to c.1870-75. Her layered, flounced skirt is draped up at the back over the projecting bustle that was fashionable in the early 1870s and is teamed with a hip-length jacket bodice. Her hair is dressed into an elaborate chignon, typical of this period, and on the column before her is placed a decorative bonnet or cap and a black lace cloak or peignoir. Her fine appearance strongly suggests that she is posing for the photographer on the occasion of a significant event. You asked whether she may be wearing her wedding outfit: since the 1873 date of her marriage to William Cogswell fits perfectly into the photograph’s time frame and the studio location is Bath, where the couple married, this seems highly likely. I can’t see a wedding ring, as one might expect, but her hand is tiny and ill defined and, in any case, the question of wedding rings in the 19th century is slightly unclear, judging from photographic evidence, so we need not worry too much about a ring. Usually by the 1870s bridal couples posed together in the studio, but a few followed the earlier convention of having separate, companion photographs taken: if so, you may at some point come across an identical photograph of William, posed in the same studio setting. This is clearly a carte de visite photograph – the earliest type of photographic print, mounted onto card. Popular in France from the mid-1850s, cartes (or cdvs) were introduced into England about1858, but were uncommon until 1860. In that year a royal album of cartes de visite was created, popularising the new format, and most of today’s surviving cdvs date from 1860 onwards. These small photos, measuring approx 10 x 6.5cms dominated Victorian portrait photography and continued into the twentieth century, only dying out just before the First World War. The style of cdv mounts – especially the design on the back - can help with closer dating of individual examples, but I don’t have the benefit of a reverse view here. I have tried to find a photographer beginning with M and whose name possibly includes a ‘c’, on the online database of Bristol photographers, but I can’t spot any likely names there. Fortunately it doesn’t matter too much about such clues in this instance as the visual image, together with William’s dates, help with determining a close time frame. Looking at the picture, this full-length composition showing the subject standing in a contrived drawing room setting is typical of early cartes dating from the 1860s and early 1870s. The customary studio props of this period, as seen here, included a draped curtain to one side and a piece of furniture or other support on which the subject leaned – here an architectural plinth. William is formally dressed in a knee-length frock coat and a waist-length waistcoat with matching trousers. His top hat has been removed, as was usual for a photograph, and rests on the plinth. The style of this outfit suggests a date in the later 1860s or early 1870s – years that tie in with William Cogswell’s life. William wasn’t born until 1848 and is clearly a full-grown man here, which rules out the early-mid 1860s for this photograph. He looks young, however, and is perhaps aged around twenty or early twenties, which implies a general date range of c.1868-72. 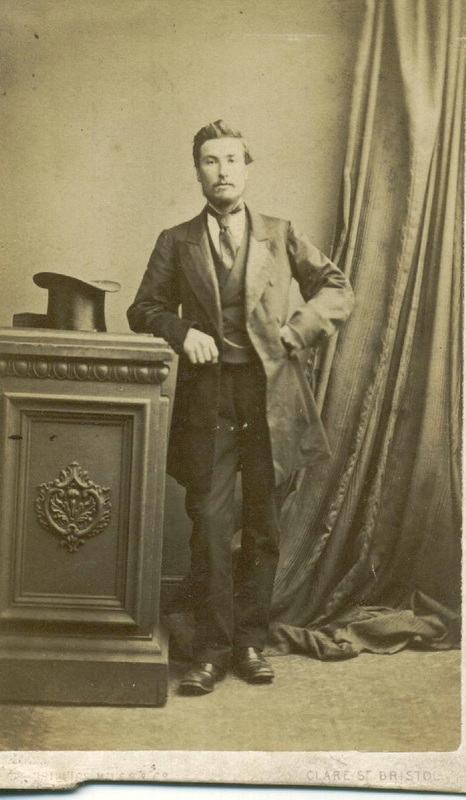 In fact, I would suggest that this photograph may well have been taken in 1869 to mark his 21st birthday – a special occasion that was often recorded in a professional portrait. Or perhaps to celebrate his marriage to Leah in October 1873.